It seems the Politicians are now realizing that the youth now have the power to decide on who can governed them due to their empty promises and lack of job creation inability when voted to leadership position thereby leading to chronic unemployment situation befalling Nigerian youths. 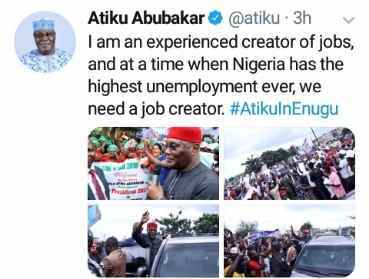 Earlier today formal vice president and presidential aspirants Atiku Abubakar share on his twitter handle that he has the ability to create jobs for unemployed Nigerians. I am an experienced creator of jobs, and at a time when Nigeria has the highest unemployment ever, we need a job creator. Few days ago, Atiku Abubakar faults the Social intervention Programme of President Buhari "Npower ". He said he noted that with National Bureau of Statistics (NBS) revelation that 7.9 million Nigerians had lost their jobs in the last 21 months, giving people “handouts” through N-Power would not solve unemployment.